Rockin' it Out: Do you know where your food is coming from? Do you know where your food is coming from? Well neither did I until I watched the documentary Food, Inc. this past Saturday. 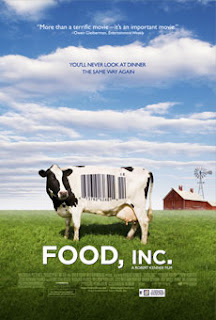 This documentary was very eye opening to the American food industry. I am not saying by watching this movie I am going to completely cut meat out of my diet and become a vegan because of the way they treat the animals, but I am definitely going to invest more time into my food choices. It made me want to know where exactly my chicken or vegetables were coming from. The truth is a lot of animals, farmers and industry workers are not treated right and to make sure they are treated with respect we need to make different choices when we shop for food. The industry has changed so much over the past 50 years due to the higher demands from fast food and consumers and it is hard to keep up. They grow chickens in half the time they used to and vegetables and fruits are bigger than ever. A lot of unnatural things are going into foods to keep up with the demand and I just find that disheartening. The real scary part was no one for a long time thought what might be happening to the consumers health by adding all these unnatural ingredients. Well it is clear to see in American that there is a problem. With heart disease, diabetes and obesity at an all time high something needs to change. They are saying by 2020 that 1 out 3 children will have diabetes... that is insane and so sad. The biggest point I took away from the movie was that as a consumer we have a lot of control of how the industry is run. If we keep buying food with all the chemicals, pesticides, added sugars, and unnatural ingredients we are saying yes to the man. By buying locally, organically, or direct from the farmer we are saying we want to know where our food is coming from. Also you are saying I care about how the animals, farmers and workers are being treated. Capitalism has it's perks, but it definitely has it's downfalls when too much power is in a few peoples hands. The food industry is definitely an example in many ways to how capitalism can go terribly wrong. And don't get me started on school lunches today and how french fries are considered a vegetable by their standards. In conclusion, after watching this movie it has moved Justin and I to make a few changes. Yes we live in Europe where food regulations are more strict and there are not as many additives as in the US, but we can still make some changes. We are lucky enough to have a farmers market twice a week and we are going to try and buy as many groceries as possible there before going to the grocery store. We are going to jump on board the meatless Mondays bandwagon. As Americans we consume more meat than any other country. For a long time in our house a meal wasn't a meal unless it had meat. This is where you come in. If any of you have recipes for meatless meals please send them my way at marisa(dot)aston(at)gmail(dot)com Even vegetarian recipes that you enjoy would be great too! Lastly we are going to pay closer attention to labels (even if they are in German) and see what exactly is in the food we buy. You would be surprised how much food is mostly made of corn or a corn by-product. I want to eat food that is as natural as possible. The purer the food the less unnatural ingredients that are going into my body. These are just a few changes that hopefully if a lot of us choose it can make a difference. If you would like to make some changes check out this link and find out the small changes that make a big impact. I love documentaries and the way they raise awareness and educate you all at the same time. Thank you Food, Inc. for making me think twice about what I am putting into my body.